Understand the concept of acupressure. Acupressure is an Asian Bodywork Therapy developed over 5,000 years ago. Acupressure relies on finger placement and pressure along pressure points on the body. 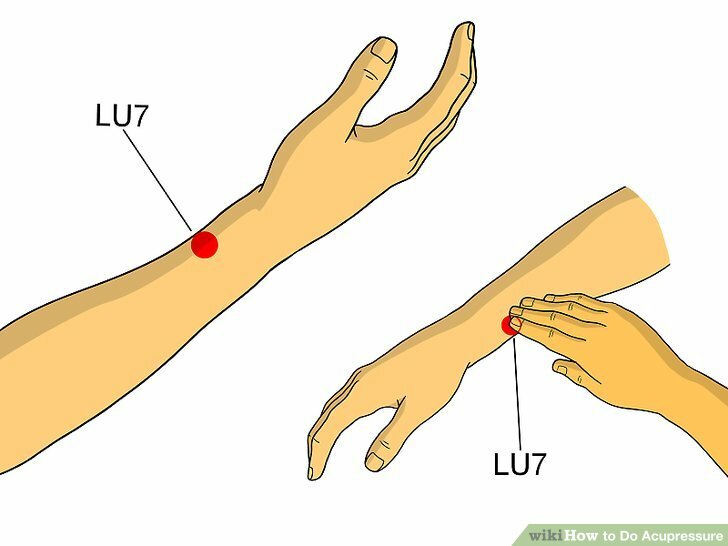 Learn what to use acupressure for. Acupressure is used for a variety of ailments. One of the most common uses is to relieve pain, such as headaches and neck and back pain. People also use acupressure to help with nausea and vomiting, fatigue, mental and physical stress, weight loss, and even addiction. Acupressure is believed to cause deep relaxation and a decrease in muscle tension. If you want to use acupressure, you need to repeat the steps over time. The techniques have a cumulative effect on the body. Each time you manipulate the pressure points, you help balance your body. Use the right amount of force. Use a deep, firm pressure when you are stimulating the points. The amount of pressure you place onto your body depends on your overall health. When pressing, you might feel a bit of soreness or pain, but it should be a balance between pain and pleasure. Do not think of acupressure as increasing your endurance to pain. If something is so painful it’s too uncomfortable or excruciating, then stop. Use the correct pressing aids. Acupressure most commonly uses the fingers to massage, rub, and stimulate the pressure points. Knuckles, elbows, knees, legs, and feet can also be used. When you press the area, you are reinforcing it. This is the most common acupressure method. To do this, use a blunt object. Don’t rub or massage the area; instead, hold the point with steady pressure. Make sure to press on the right spot. 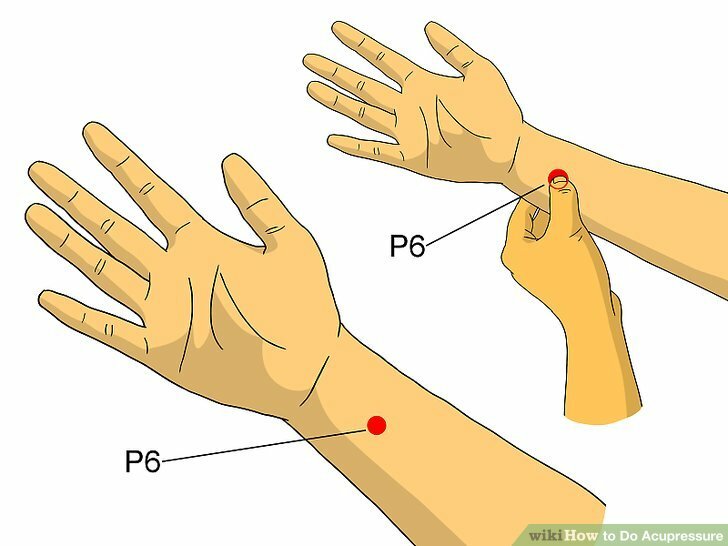 These acupressure points are very small, so they have to be precise. If you don’t feel any effects, then try different spots. 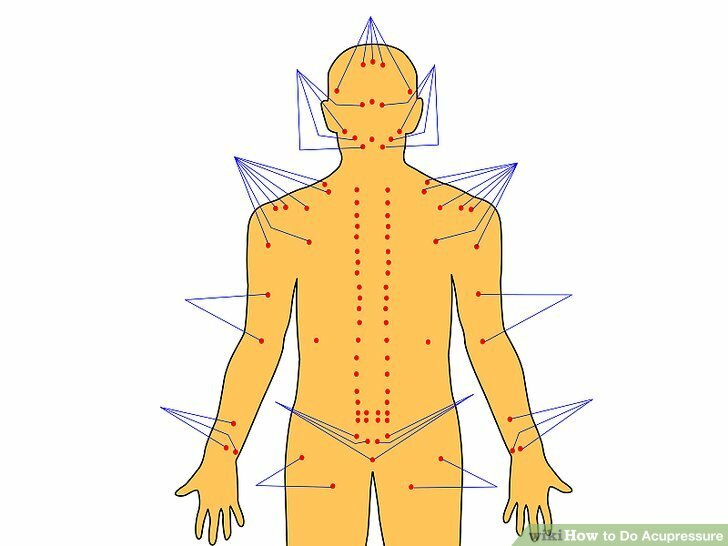 When performing acupressure, you want to look for sore pressure points. If there is no blockage, you won’t feel any effect from pressing the point and won’t need to treat it. Press for the appropriate length of time. Acupressure employs steady presses to the pressure points. By pressing a point for only half a second, your body will start to respond. This is a good way to try to find the pressure points when just beginning. Release the pressure point gradually. After holding the pressure point for the desired amount of time, slowly release the point. Don’t just yank your hand away. Releasing the point gradually is believed to allow the tissues to heal by giving them time to respond to the release in pressure. Perform acupressure when your body is in the right state. Acupressure should be performed when you are relaxed, preferably in a private place. 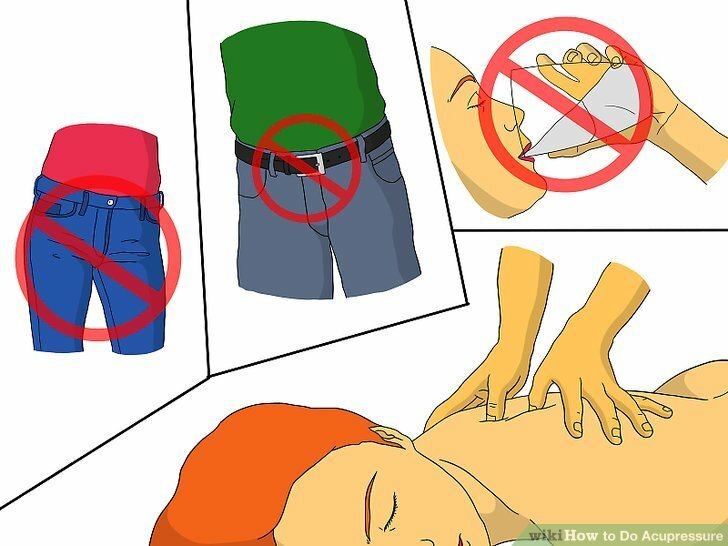 You can sit or lie down when administering acupressure. Try to cut out outside distractions and stress. Turn off cell phones and play relaxing music. Use aromatherapy. Try any technique that will promote relaxation. 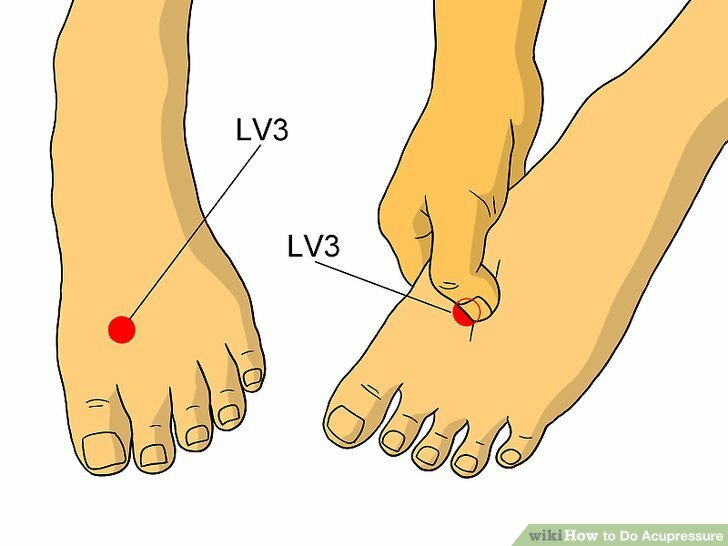 You shouldn’t use acupressure techniques right before a big meal or on a full stomach. Wait for at least an hour after eating so that you don’t get nauseated. Don’t drink iced drinks because that can counteract the effects of acupressure. Instead, drink hot herbal tea afterwards. Gallbladder 20 (GB20), also called Feng Chi, is recommended for headache, migraines, eye blurriness or fatigue, low energy, and cold or flu symptoms. 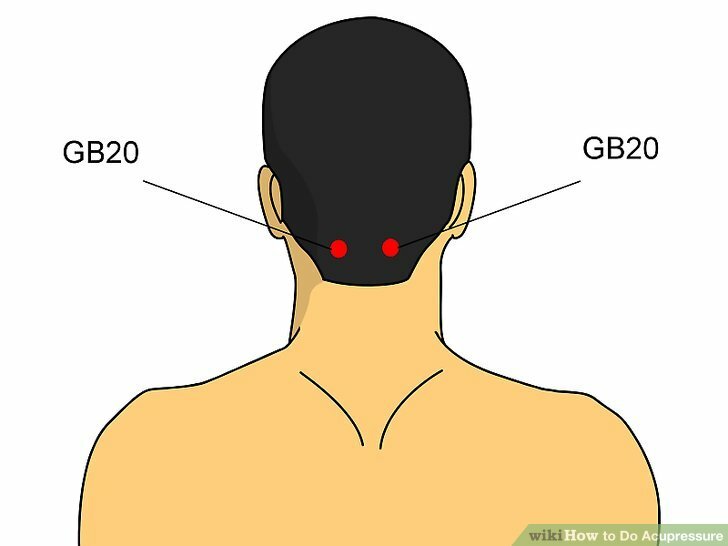 GB20 is located in the neck. Gallbladder 21 (GB21), also called Jian Jing, is commonly used to treat pain, neck stiffness, shoulder tension, and headaches. GB21 is located in the shoulder. Large Intestine 4 (L14), also called Hoku, is commonly used for stress, facial pain, headaches, toothaches, and neck pain. 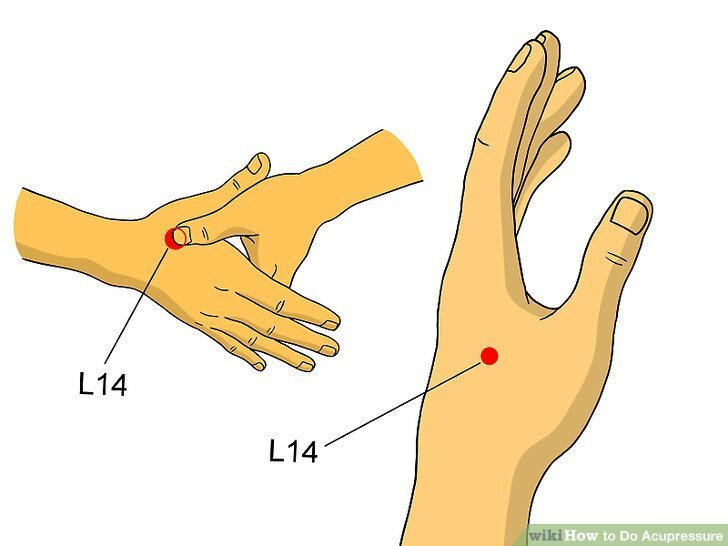 L14 can be found on the hand between the thumb and the index finger. Liver 3 (LV3), also called Tai Chong, is recommended for stress, lower back pain, high blood pressure, menstrual cramps, limb pain, insomnia, and anxiety. It is located in the soft flesh between your big and second toes. Pericardium 6 (P6), also called Nei Guan, is recommended to relieve nausea, upset stomachs, motion sickness, carpal tunnel syndrome, and headaches. It is located just above the wrist. Stomach 36 (ST36), also known as Zu San Li, is commonly used for gastrointestinal discomfort, nausea, vomiting, stress, boosting your immune system, and fatigue. It is found below the kneecap. Lung 7 (LU7), also called Lieque, is used for head and neck pain, sore throat, toothache, asthma, coughing, and overall immune health. It is located on the arm.